Hostel Albergue de turismo superior "La Fábrica"
Lock in a great price for Albergue de turismo superior "La Fábrica" – rated 9.3 by recent guests! The bed was exceptionally comfy and the staff extremely helpful and very happy and couldn’t do enough for us. We have stayed there before and it’s definitely our favorite place to stay when traveling from France to Andalusia Spain. Gorgeous! What a spectacular job converting an old stone mill into a beautiful inn. We loved the view from our room and the friendly bar downstairs. One of the nicest places we’ve stayed on the Camino de Santiago. Lovely renovated stone mill, with a restaurant downstairs. 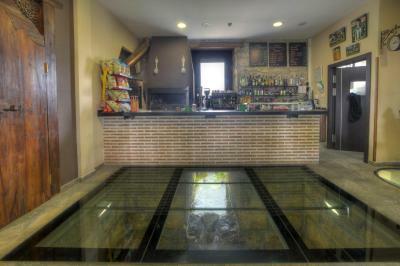 Glass floor in the bar, with the rushing river, is cool. The bedrooms were quiet, comfortable, with stylish handmade decor. The restaurant had the BEST pilgrim meal (great selection, including several vegetarian options) we had on our month long trip. We would absolutely stay there again, with a car or walking the Camino. Friendly, helpful staff. Owners very helpful, beautiful room, clean. Bathtub! A beautiful building, comfortable room, and good, reasonably priced food. Wonderful restoration of an old flour mill. Quiet and peaceful. Two things are fantastic in this hotel - the bed and the tub - I suppose because it mostly hosts people that are doing the Camiños de Santiago, so they need to have a nice relaxing shower and a good rest. Superb renovation with great rooms and the best shower we’ve had this trip. Fabulous place. I stayed in a lovely room and had best shower on the Camino with jet sprays! Like a boutique hotel, not a hostel. Excelllent dinner and breakfast. Comfy bed and quiet. Stay here!! Each room at "La Fábrica", has unique décor and includes heating and a wardrobe. The accommodations offers private rooms and dormitories. The bathrooms come with a shower. Featuring exposed stone walls and wooden beams, the restaurant offers local food for lunch and dinner. 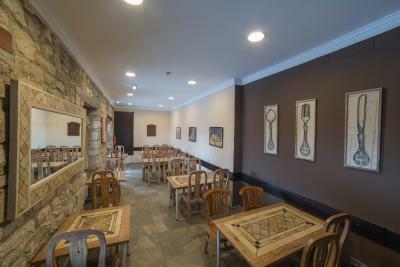 Guests have access to a shared lounge and tourist information is available upon request. A-231 Motorway is 1.2 mi from the hostel. The city of Burgos is 15 minutes' drive away. This property also has one of the top-rated locations in Tardajos! Guests are happier about it compared to other properties in the area. When would you like to stay at Albergue de turismo superior "La Fábrica"? This larger room offers heating, free WiFi and a wardrobe. Bed linen and towels are provided. This larger room offers free WiFi, a flat-screen TV, heating and a wardrobe. There is a private bathroom with a shower. Bed linen and towels are provided. 4 reasons to choose Albergue de turismo superior "La Fábrica"
House Rules Albergue de turismo superior "La Fábrica" takes special requests – add in the next step! Albergue de turismo superior &quot;La Fábrica&quot; accepts these cards and reserves the right to temporarily hold an amount prior to arrival. Albergue de turismo superior "La Fábrica" accepts these cards and reserves the right to temporarily hold an amount prior to arrival. Please inform Albergue de turismo superior "La Fábrica" of your expected arrival time in advance. You can use the Special Requests box when booking, or contact the property directly using the contact details in your confirmation. See all guest reviews for Albergue de turismo superior "La Fábrica"
Newest Reviews for Albergue de turismo superior "La Fábrica"
No shade in car park....as we have dogs. Our room was clean, spacious, quiet and well appointed. We loved it. The food was good too. Every thing was ok..just the car park..
Room was very clean, comfortable beds, great views, excellent meal. Great value. Slightly off the Camino trail, but wasn’t a problem for us as we had a car. Would definitely stay again if in the area. Homie style settings, more like B&B. Good dinner. Great place to stay, friendly and helpful staff. Lovely location easily accessible. Fabulous room. Great value for money and a good bar restaurant downstairs. Recommend! !